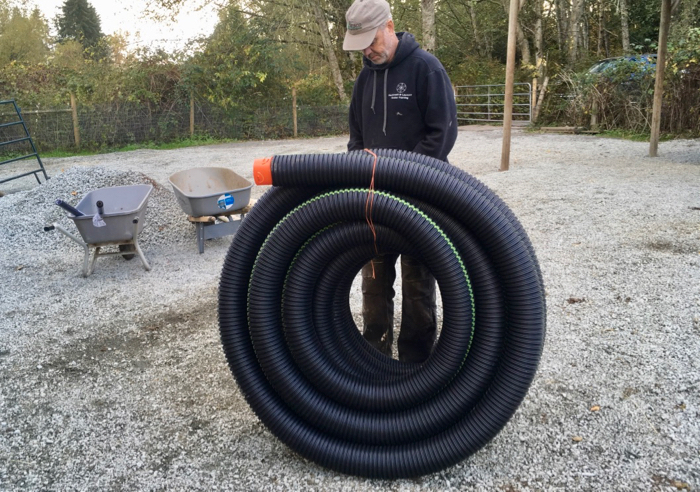 After numerous experiments with culvert drainage for my graveled horse paddock, I finally decided to start all over again and do it properly – from start to finish. My cousin Adam was in town and since he used to work in the UK (also rainy! ), has an architecture degree, and has worked on numerous building projects, I felt we finally had a good chance to get this to work! Adam not only studied French Drains in college, he’d also installed several. So here’s our step-by-step guide, showing you exactly what to do. I’m going to give you the steps first – so when you’re standing out there constructing yours, you can quickly scroll through the steps and make sure you’re on track (and not forgetting a step!). Next, I’ll take you on a pictorial journey of how we constructed my paddock drain, so you can see all the details. 1. Watch the Water – study your paddock (or field) when it is raining and watch where the water wants to go. If we can work alongside what already wants to happen on our land, we can be the most efficient. 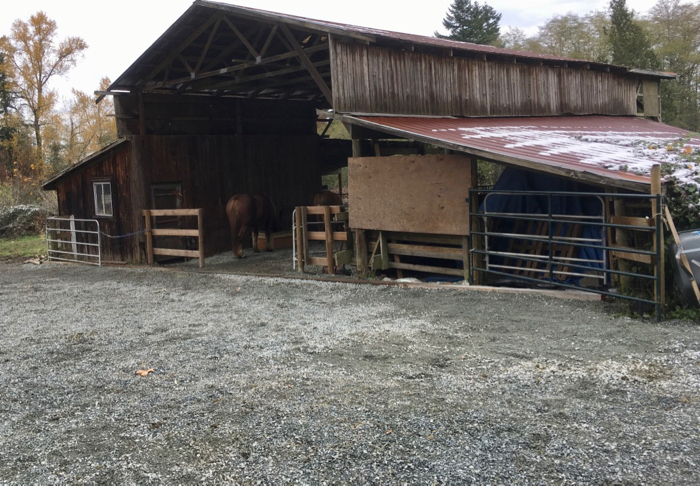 For my paddock, I had two drainage paths: One came from behind my hay shed and flowed out near the entrance to the shed. And the other drained from the top of my paddock, towards one side and into the barn. 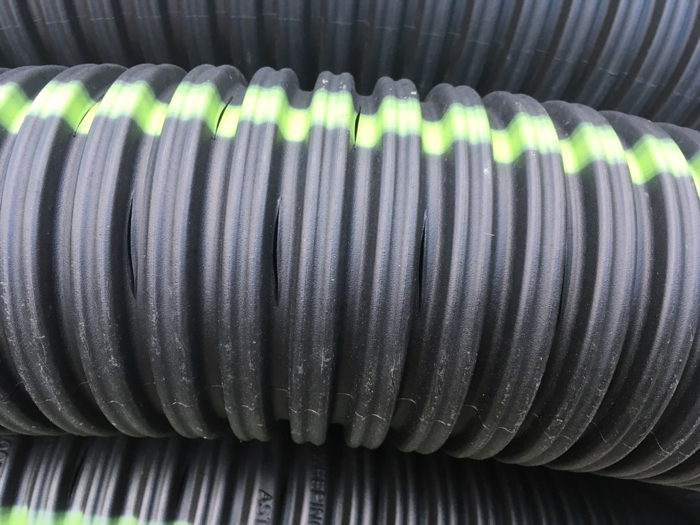 4-inch diameter perforated drainage pipe – ideally one that comes with a ‘sock’ around it already, like this one. 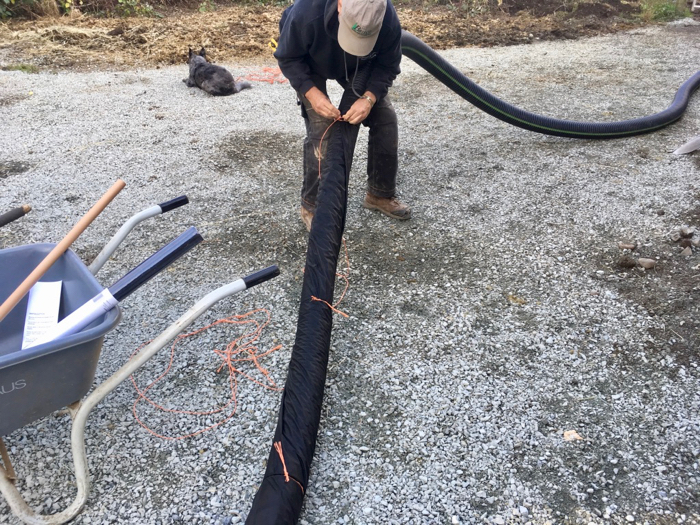 If you can’t find one wrapped already in drainage cloth, then purchase geotextile or landscape drainage cloth to wrap around the pipe – at least 12 inches wide. 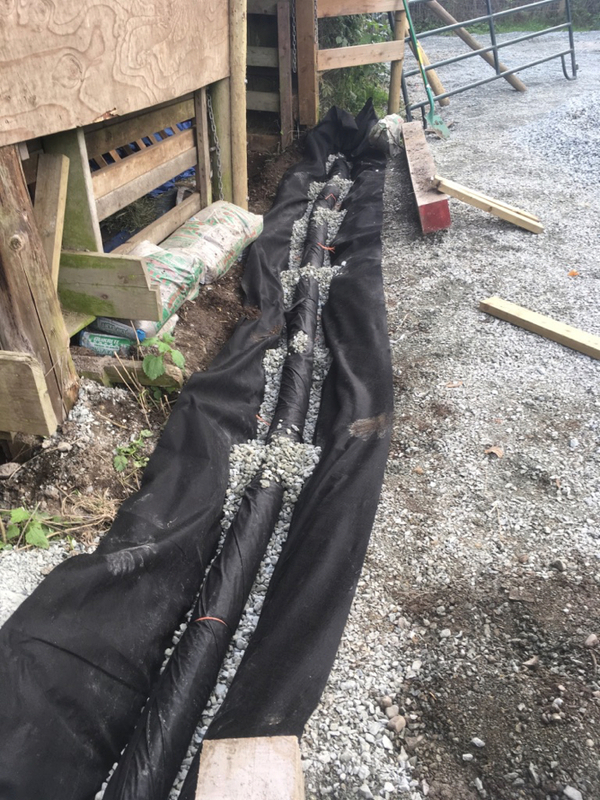 Clear crushed gravel to line and cover your pipe. Smooth river rock is no good as it moves around too much. 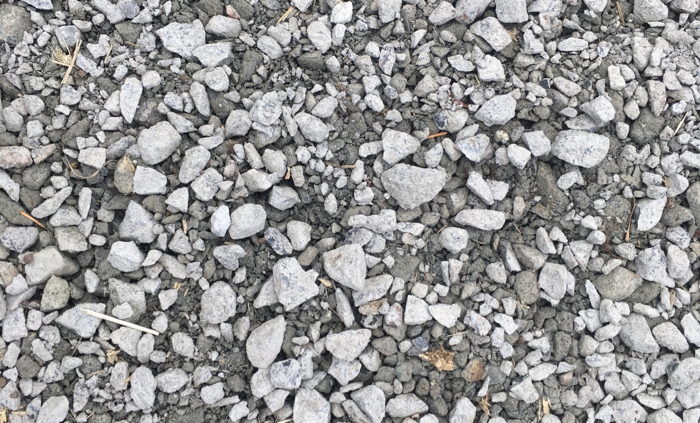 Crushed gravel with fines (eg. 3/4 inch minus) is no good as it packs down too tight and inhibits drainage. 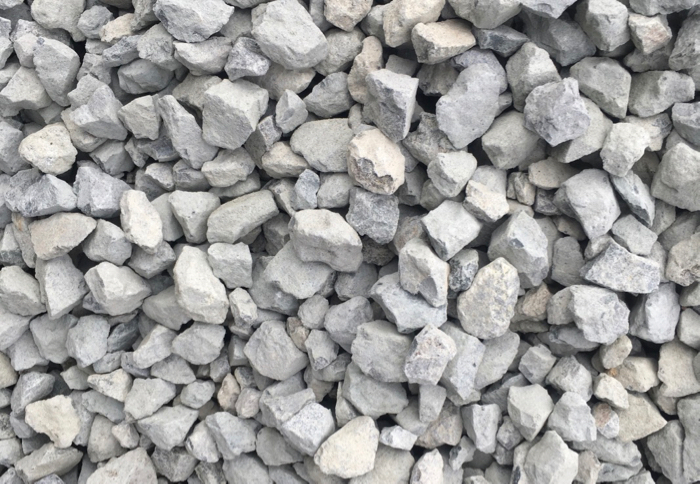 So you want the rough edges of crushed gravel, to fit/lock together, but you want it clear of dust and smaller gravel pieces. Anywhere from 1/2 inch – 1 inch clear crush is good. 3. Mark & Dig your Trench – Mark out the length of your trench. It doesn’t need to be perfectly straight, it can curve a bit, if desired. 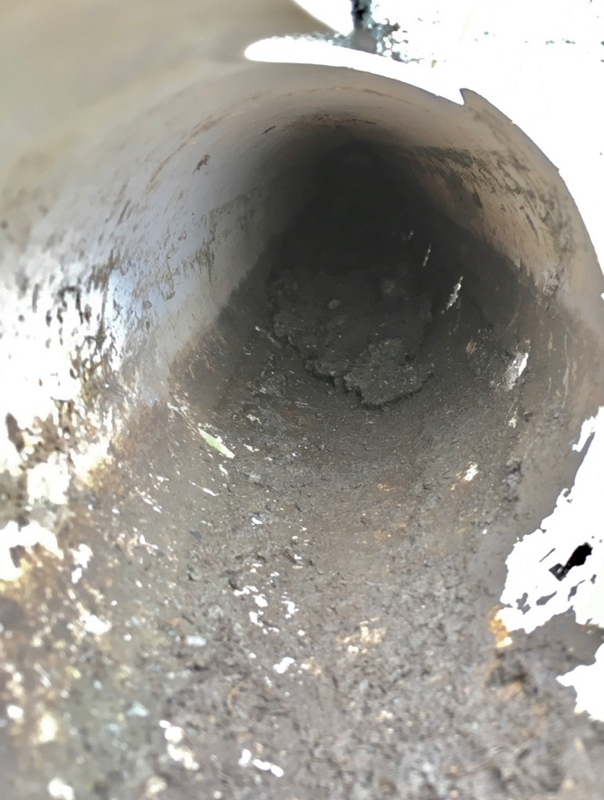 And the width of your trench – using a 4″ drain pipe – should be 1 foot wide. See #4 & 5 to figure out the depth of your trench. Use a pickaxe to loosen packed earth and rocks, then scoop out with a pointed shovel and into a wheelbarrow. Dump earth somewhere handy, as you may need it later. 4. Figure Out your Slope Gradient – Once you have the length of your trench in feet, multiply that by 0.125 – the resulting number is the difference in depth between the start of your trench, and the end point; which will ensure you have enough slope gradient for water to be drawn down to where you want it. You need at least 1/8 inch (0.125 inch) of slope per foot. For example, our trench was 50 feet x 0.125 = 6.25 inches. So that means the bottom of our trench needs to be at least 6 and 1/4 inches lower than the top of our trench for the water to drain properly; especially during pelting rain. 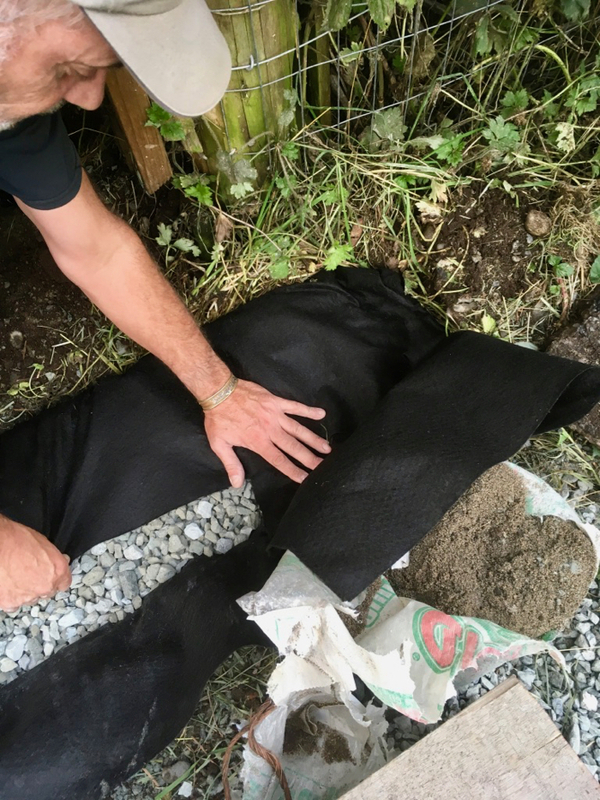 – 2-6″ gravel on top of geotextile cloth – if horses will NOT be walking on the drain, or, if you are laying timbers on top of the drain, then you only need 2 inches of gravel. 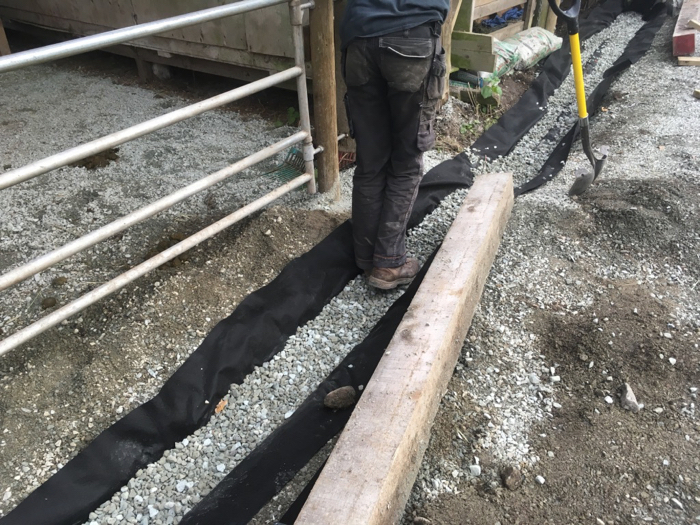 If you are not laying timbers and your horses will be walking on the drain, then you need to lay 4-6 inches of drainage gravel on top of the geotextile cloth. 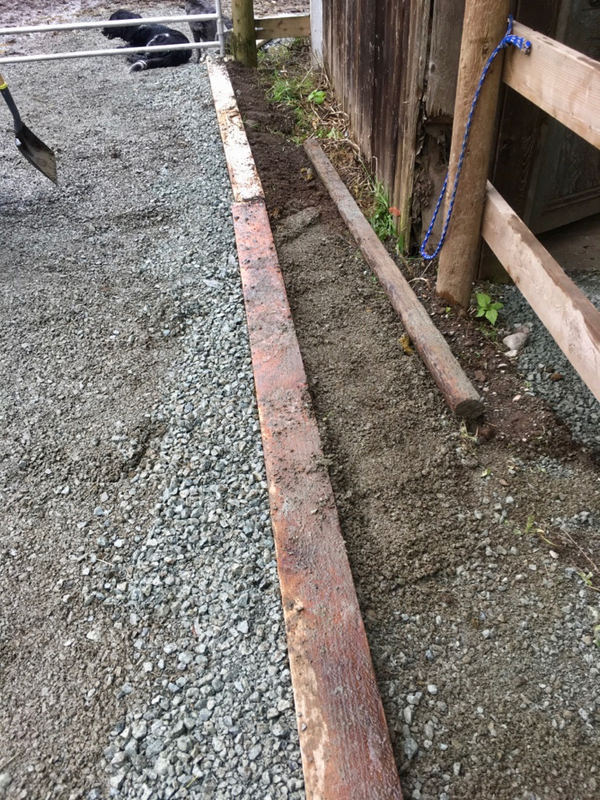 Since we were adding timbers on top of our pipe, we figured 9 inches was good for the start (intake) of our trench, and so the end (outflow) of the trench needed to be 15 and 1/4 inches deep (9 + 6.25 = 15.25 inches) to provide adequate slope for good drainage. 6. 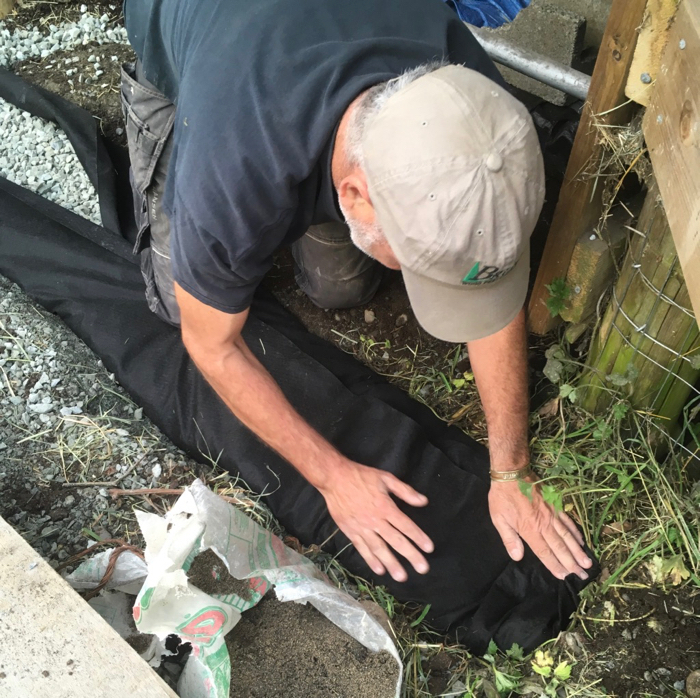 Line your Trench – Stomp down the dirt when you’re finished digging and line it with your geotextile or drainage cloth. 7. 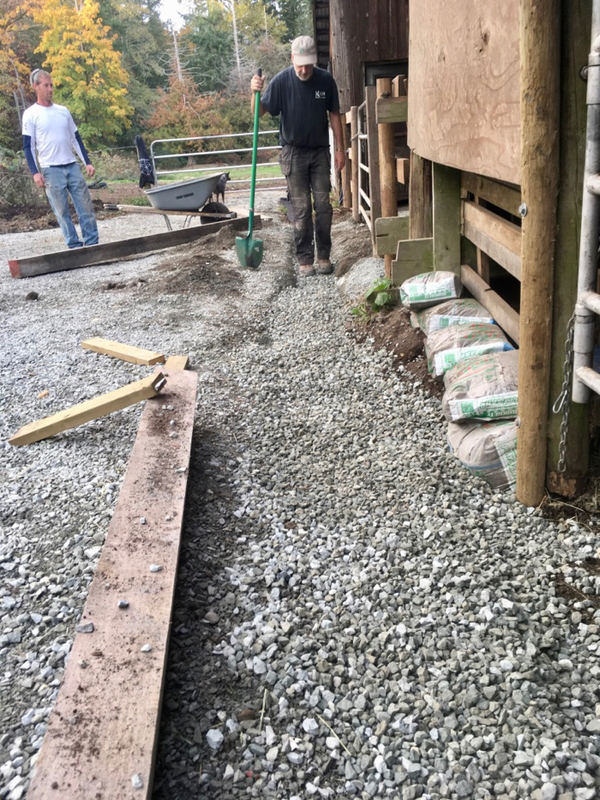 Add the Bottom Layer of Gravel – Pour 1-2 inches of drainage gravel along the entire length of your trench. 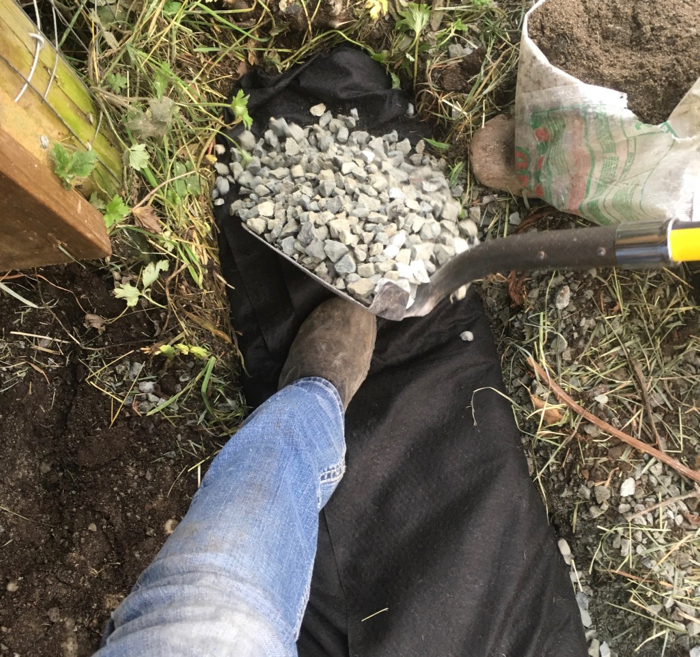 Use the gravel to even out any uneven spots in the earth (creating a flat bottom for the pipe to lay on), making sure you have at least an inch of gravel at all places. 8. 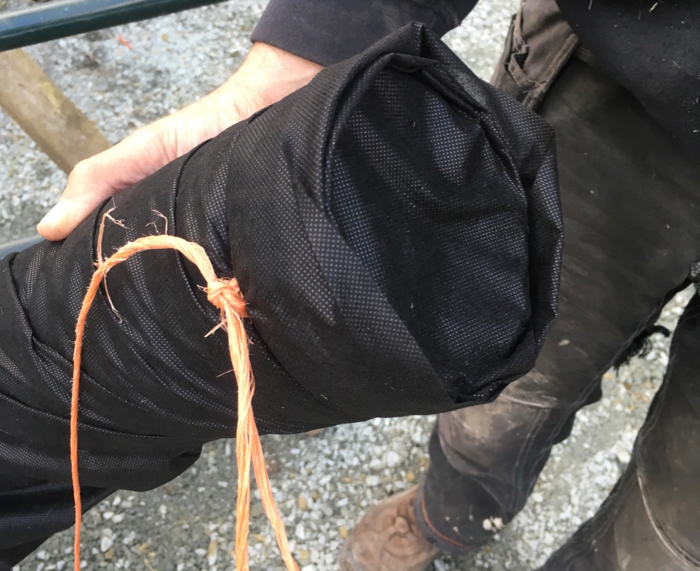 Wrap your Pipe – If your drain pipe did not come with a sleeve, then you need to wrap it tightly in another piece of drainage or landscaping cloth. Secure the cloth with zip ties or twine, so it doesn’t unwrap. 9. 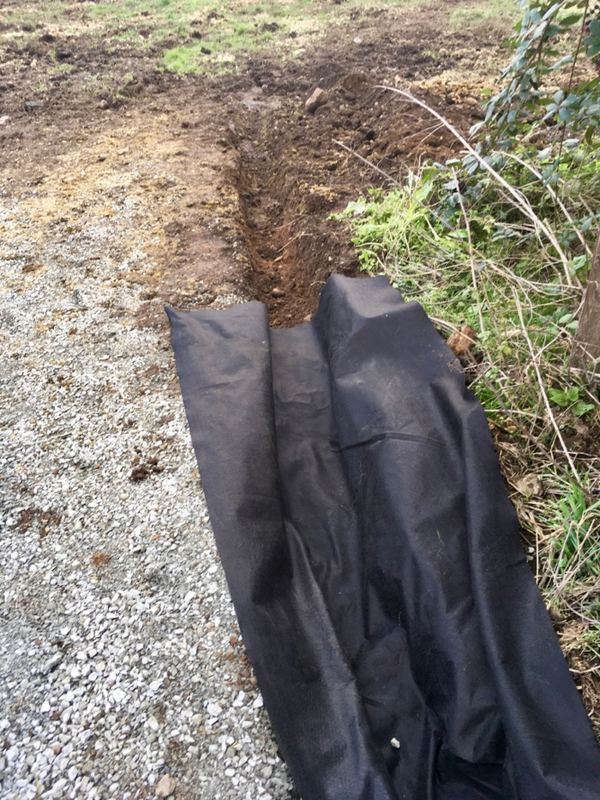 Lay Pipe in the Middle of the Trench – Now lay your wrapped pipe on top of the base layer of gravel in your trench. Hold the pipe in the middle of the trench as you toss gravel along the top every 2-3 feet to pin it to the center of the trench, all the way along. 10. 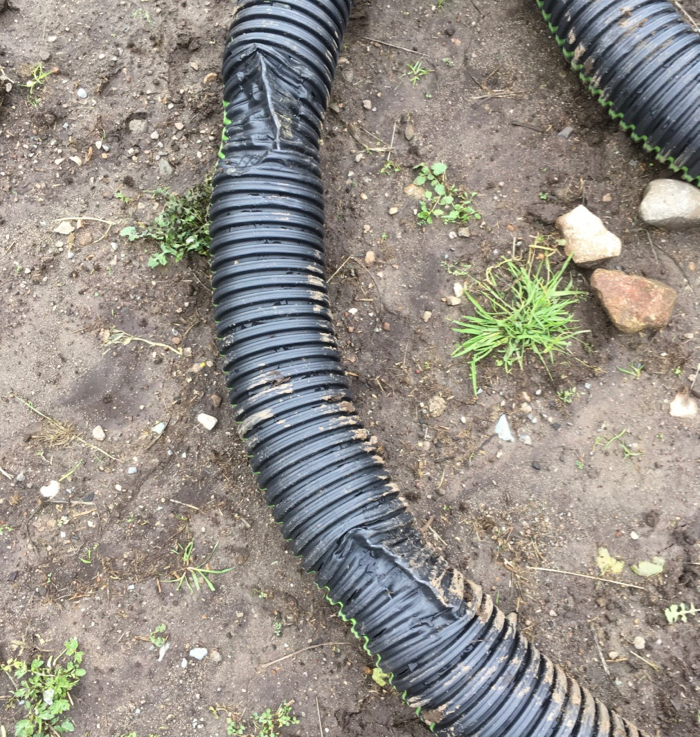 Cover Entire Pipe with Gravel – Cover the entire length (and fill in the sides of the trench) of your drain pipe with at least 2 inches of gravel covering the top of the pipe. 11. 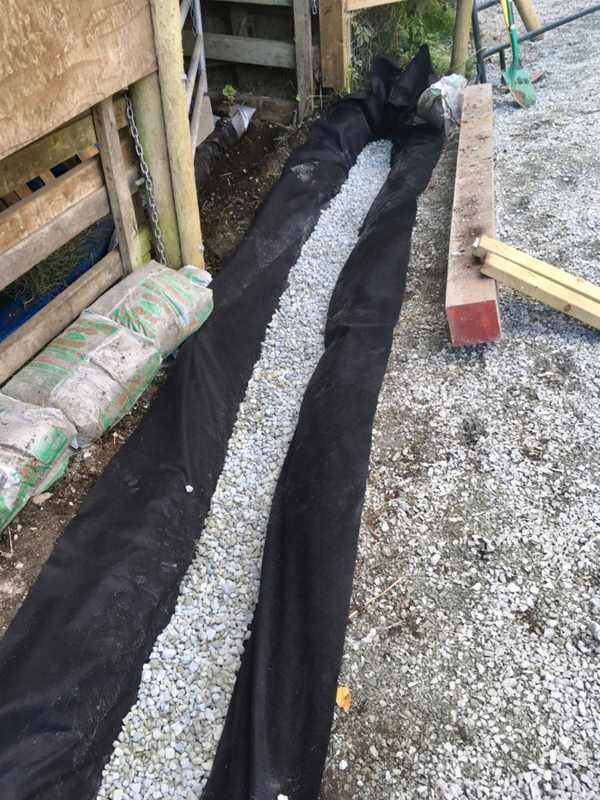 Wrap Geotextile Cloth Around Pipe & Gravel – Tug up the sides of the drainage cloth lining your trench, and fold the cloth over the top of all the gravel and pipe you have just laid. 12. 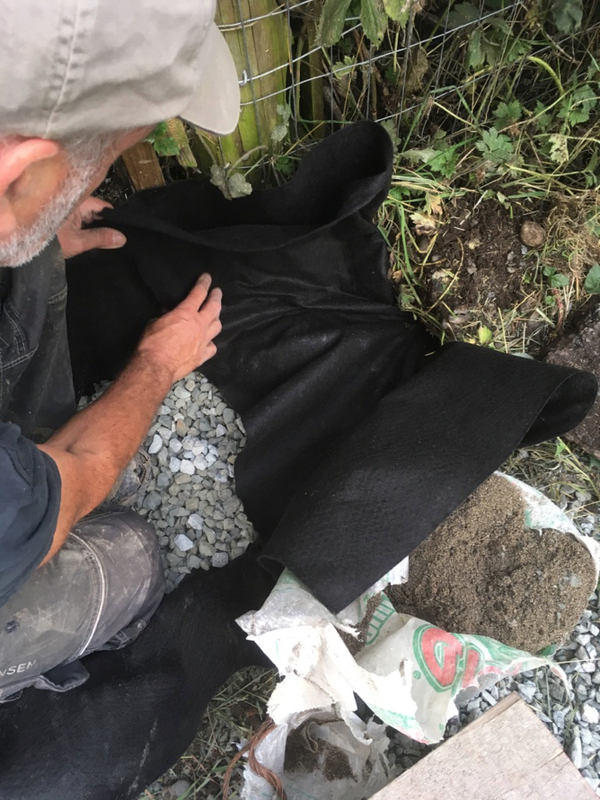 Cover Completely with Drainage Gravel – Cover the entire top of the geotextile cloth with more drainage gravel. 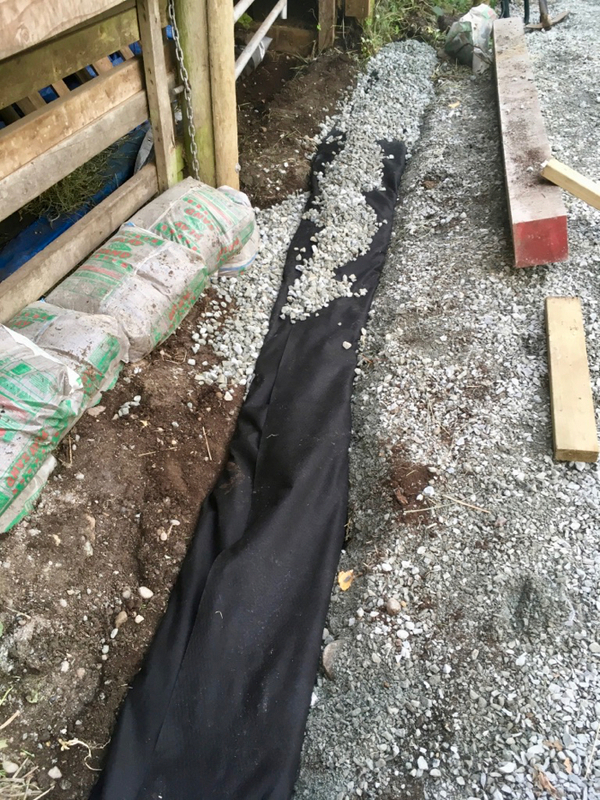 If you are NOT putting timbers on top of the pipe, then you need to put at least 4 inches of gravel on top of the geotextile/pipe – 6 inches is ideal, as the horses will kick and move the gravel around a lot. 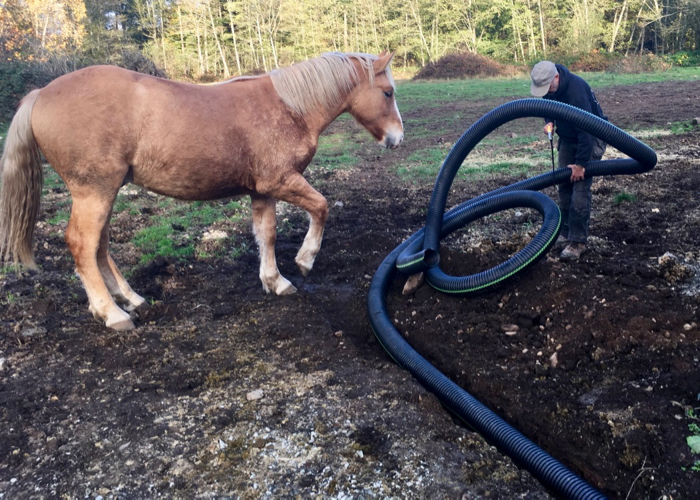 If horses will not be walking on your pipe (or you are laying timbers on top like we did), then you can put only 2 inches of drainage gravel on top. Alrighty, now that you’ve had the overview, let me take you on a pictorial journey of exactly what we did (where the learning really sinks in) and how we did it. 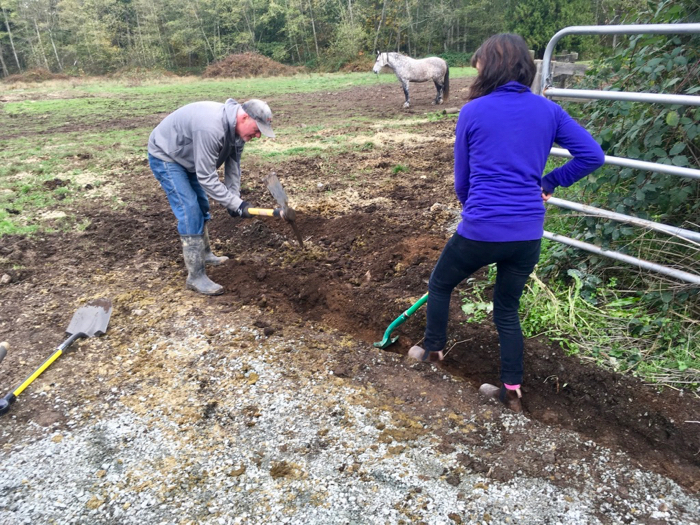 We found the most efficient way to work (because we had to get this entire drain finished in one day) was to have one person break up the soil, clay, rocks with a pick-axe and have another person follow them with a pointed shovel to dig out the trench. 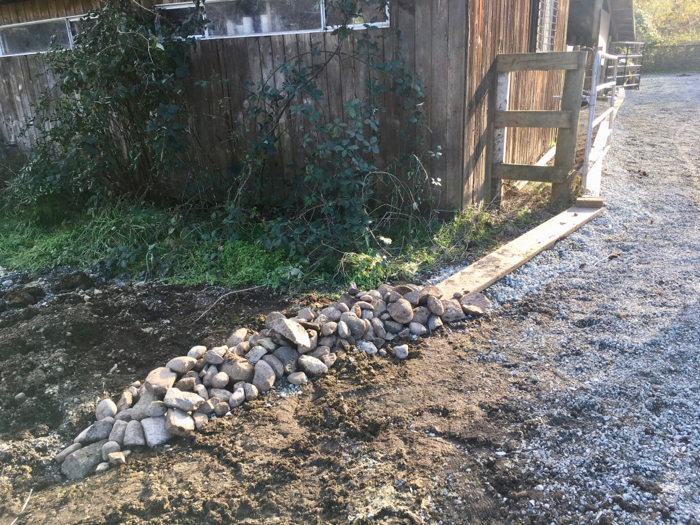 In the paddock we shoveled the soil into a wheelbarrow so it wouldn’t dirty the gravel and dumped the soil nearby in case we needed it again..
For our 50 foot French Drain, we ordered 3 cubic yards of Clear Crushed Drainage Gravel and it was just enough. If we had not placed timbers on top of the pipe though, we would have needed at least 5 cubic yards. Next, we laid the wrapped pipe in the middle of the trench, on top of the first layer of gravel. It was also time to decide how much pipe to extend out into the field and cut off the unwanted length with a handsaw. 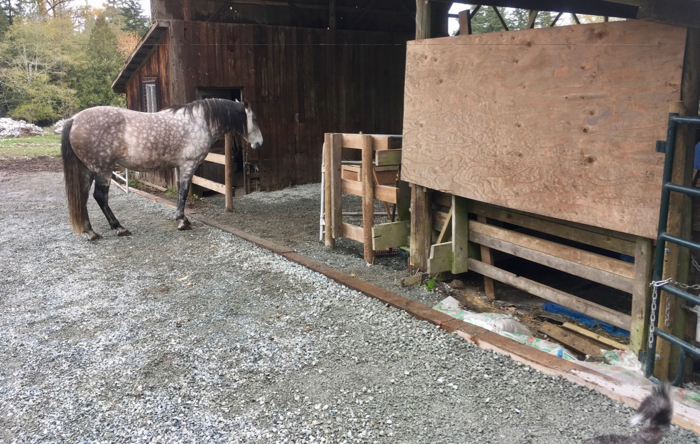 You can see how curious the horses are and why you don’t want to leave your pipe unattended or exposed. 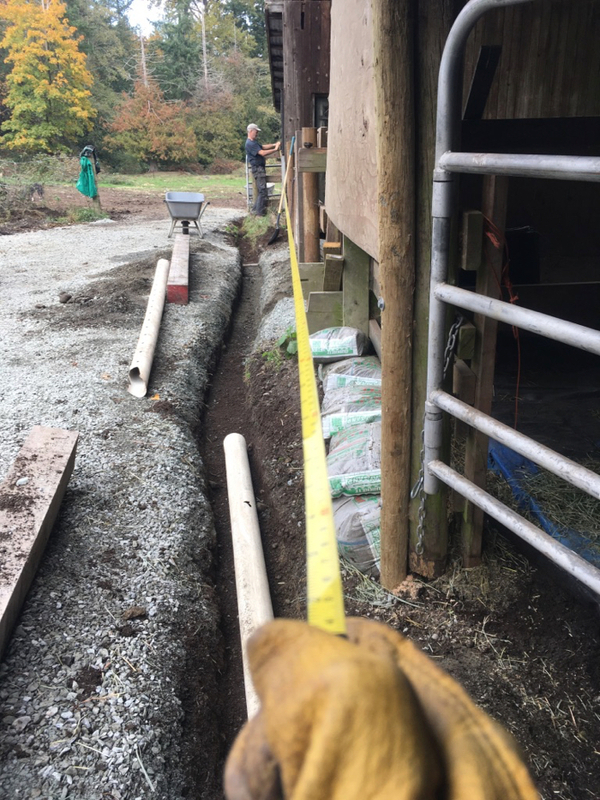 Now that we had the pipe cut to size, we threw gravel in piles along the length, to pin the pipe to the center of the trough. 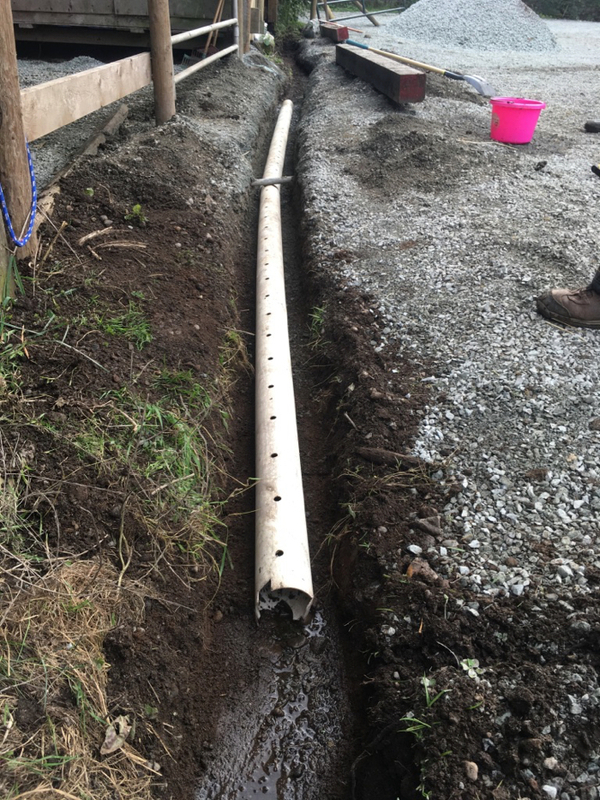 Once you have the pipe fixed in place in the middle, it’s easier to throw gravel quickly on top to fill up the sides and then an inch on top of the pipe. 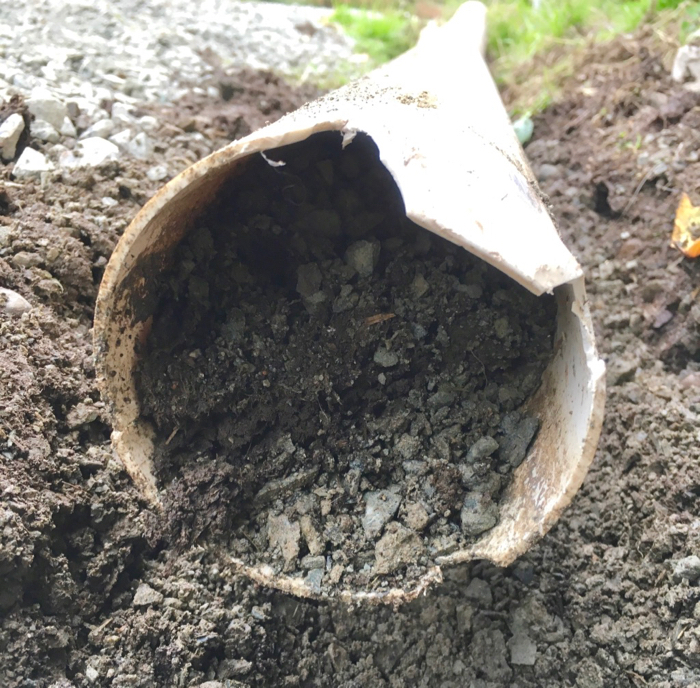 If you don’t pin it in place first, your shovelfuls of gravel thrown on top or sides will knock your pipe out of position. Finally, it’s time to lay the cedar timbers on top. When the rains hit hard for 2 – 3 days continuously (or 2 – 3 weeks!) the water starts to run on top of the gravel as well. 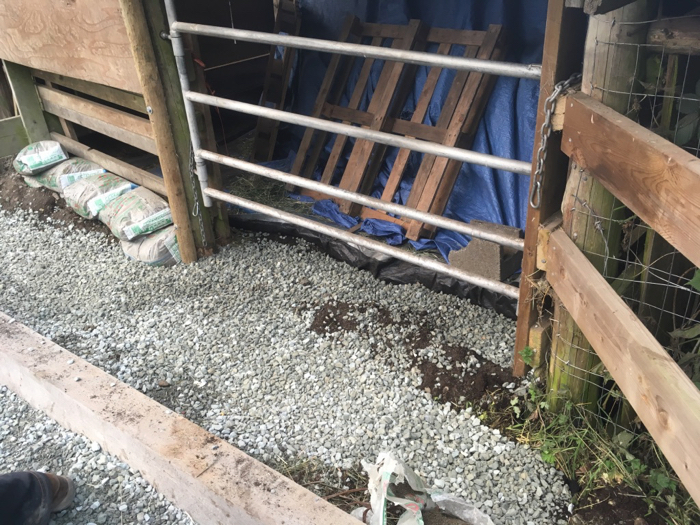 So I also wanted a physical barrier to stop the water from washing down over top of the gravel and into the barn. We figured these big 6-inch square, 10-foot long cedar timbers would do the trick. Cedar can withstand a lot of water without being treated and the cedar yard sold me these for half price because they were old and had sat out uncovered for a while – perfect! 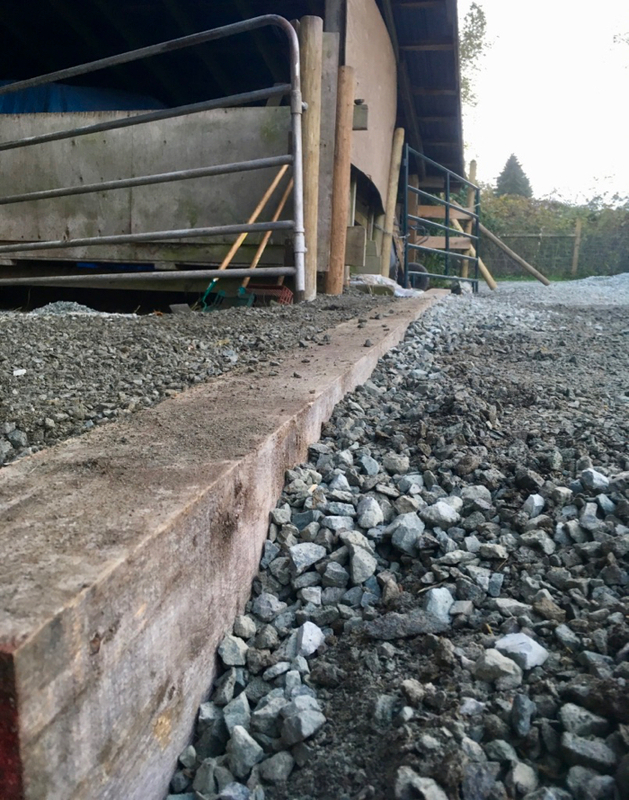 We left about 1.5 – 2 inches clear at the top of the timbers to stop the water like a dam and then filled in the front (drainage) side with drainage gravel. Along the backside (no water problem there), we packed the timbers with earth or regular paddock gravel, and even used some sandbags I had lying around. We needed to inset the timbers and then pack them on both sides so they wouldn’t shift when the horses walked (or wrestled!) on top of them. 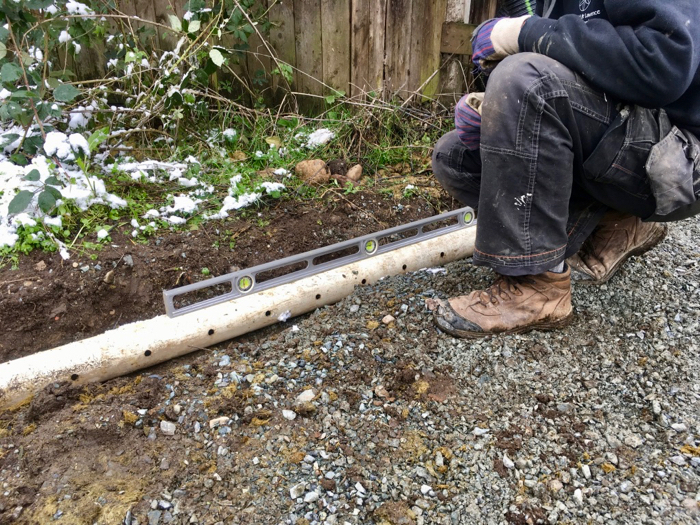 At the field outflow end of the pipe, we covered that with drainage gravel too – about 3 inches – and then put a 2×12-foot plank on top of the gravel and piled rocks we gathered from the field, on top of the last section of pipe, at the end. I hope this will encourage the horses to step over the pipe once this area dissolves into 18 inches of mud. I will go out later and see if I can find more rocks to replace the board – I think the rocks will be an even better deterrent than the plank. But it’s fine for now. By February, this drain showed its worth as we were flooded with 3 weeks of almost non-stop rain. 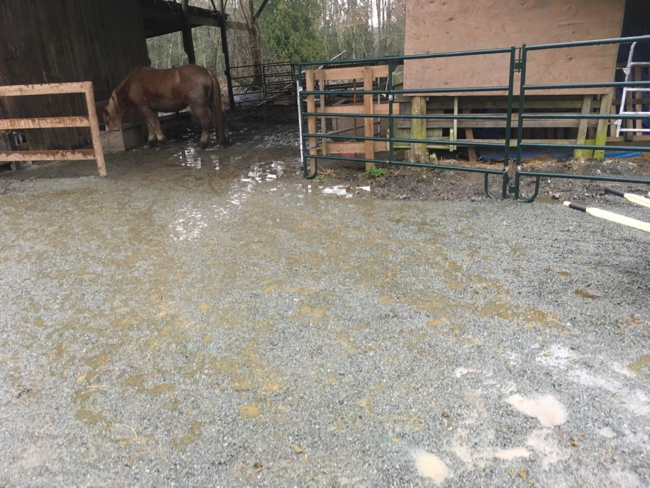 Not only was the barn and paddock kept dry, but at the outflow end of the pipe, the water was flowing out with enough force to create ripples and displace silt!